When Nevil Shute came to Australia to live he bought 183 acres of virgin scrub land about forty miles from Melbourne. There he built a beautiful home and developed a very fine farm - for he loved pigs and cattle. On the farm were two small lakes, and it was his wish to build a model ship to operate on these waters. He set about it in his characteristically thorough way. The hull was to be based on the ME P.B.9 motor trawler Gleaner, plans for which were obtained from Percival Marshall and Co. From them he worked out the following details for full, three-quarter and one half sized hulls. graph as 44.77 cubic inches for half of the hull below the water line. This gave 89.54 cubic inches for total displacement and represented 6.47 lb. I do not know which size he selected. It was probably the three-quarter size, for his first stage in construction was to build a Stuart Double-10 steam engine. As will be seen from the photograph, it was beautifully made and fitted with a mechanically-operated water pump and lubricator. larger capacity. He bought two complete sets of castings so that he would not be held up if he had to discard any components because of a defect in materials or workmanship. 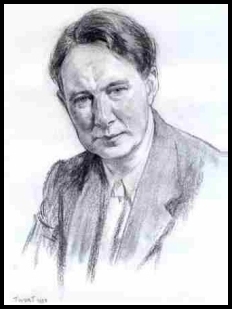 In a letter to me on 7 August 1959, shortly before his death, he wrote: "At the moment, however, the Seal Major engine is engaging my attention, and that will keep me busy for a quite a time although now that the book is finished I shall be taking a month or two of holiday and shall get on with it a bit quicker. So far, cylinder liners, pistons and gudgeon pins, and valve guides are finished together with the timing spur wheels, and I am now starting work upon the crankshaft to be followed by the camshaft. I think the best plan on a job like this is to get all the bits and pieces made and then to tackle the final erection in one go when everything is to hand; otherwise one might tend to get in a bit of a muddle and one might find that parts already faced up and assembled might require some small alteration." The photographs show the parts which had been completed before he died. They were beautifully made. 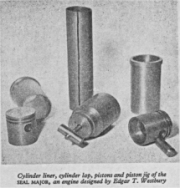 All the finished and unfinished components, together with the plans, calculations, tools and jigs used in their building, were given to me after his death, and I hope to complete the engine in accordance with Edgar Westbury's instructions in ME Volume 96 and 97. Nevil's workshop, although small, was well equipped with an ML 7 Myford lathe, a bench drill and an Adept No 2 power-operated shaper. The lathe, with the vertical slide and so forth, went to the manager of the farm, and the shaper, dividing-head and small tools are now in my possession. 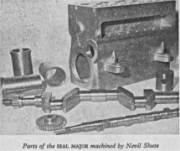 Nevil fitted a hacksaw to his shaper and described it in ME of 1 October 1959. Herman Annowsky and I arranged for the little steam engine to be preserved in a Perspex case as an heirloom for his family. The single-cylinder petrol engine was, I believe, given to the nearby Peninsula Church of England School.